In the Red and Blue game version of Pokemon, the 3 starters are Squirtle, Charmander and Bulbasaur. As the anime is based on the game, it would be logical that the main Pokemon (the one with Ash since the beginning) is one of those three starters. Is there any specific reason why any of those three Pokemon weren't chosen to be the mascot? Why and how was Pikachu chosen by the producers over all the 150 other Pokemon? Ash did have the choice of choosing from the starter trio. But he wasn't able to, since he arrived late. The starter trio had been chosen by other trainers and Professor Oak gave Ash a Pikachu. This plot was shaped in a clever manner to bring Pikachu up as Pokemon that will represent the Pokemon series. IO:I think it’s like being the owner of a pet dog; you’re always wondering what your dog is thinking, but you also believe that you understand your dog better than anyone else could ever hope to understand it. You can tell its thoughts just by looking at its face or how it is behaving. Whether it’s hungry, happy or sad. That’s exactly how Satoshi and Pikachu communicate. Because Pikachu can’t say anything other than its name, the audience has to think about what the “Pikachu” noises mean and learn to understand the character. Ultimately, I think kids feel like they are Pikachu’s owner. The reason Pikachu was chosen to be the mascot, was because of its popularity. It was a brilliant marketing scheme, by taking advantage of the popularity of Pikachu from the games, and incorporating it into the anime and merchandise, sales had soared. The dynamic yet cute relationship between Ash and Pikachu was also another factor to bring up the sales. 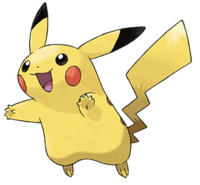 Pikachu is among the most recognizable Pokémon, largely because a Pikachu is a central character in the Pokémon anime series. Pikachu is widely considered the most popular Pokémon, is regarded as the official mascot of the Pokémon franchise, and has become an icon of Japanese culture in recent years. In the first episode, Ash receives his Pikachu from Professor Oak as his starting Pokémon. New trainers are given a starting Pokémon; in Ash's homeland of Kanto this is often Charmander, Squirtle, or Bulbasaur, but Ash overslept and got Pikachu instead.